As I walked along the banks of the River Guadalquivir in Seville early on Friday afternoon, taking time to watch the rowers on the river between the Torre del Oro at the Puerta de Jerez and the Puente de Isabel II, I took time to admire two sculptures close to the Triana Bridge that are moving reminders of tolerance and intolerance in Seville. The ‘Monument to Tolerance’ by Eduardo Chillida, accompanied by a poetic text by Elie Wiesel, recalls the mutual tolerance that was often found in Seville until the ‘Catholic Monarchs,’ Ferdinand and Isabel, and the Spanish Inquisition expelled all Jews from Spain in 1492. On the other side of the pedestrian steps up to the bridge, a sculpture by Emilio García Ortiz in 1984 commemorates Fray Bartolomé de las Casas (1484-1566), a Dominican friar and missionary bishop from Seville who is revered as a ‘Universal son of Seville’ and a father-figure in the development of international human rights. The sculpture stands on the bank of the Guadalquivir River, across from Triana, where Fray Bartolomé de las Casas was born, to mark the fifth centenary of his birth, and shows Fray Bartolomé as Bishop of Chiapas with some Indians and some Spanish soldiers. The sculptor Emilio García Ortiz (1929-2013) was also born in Triana, and for many years he was Professor of Sculpture and Ceramics at the Faculty of Fine Arts in the University of Seville. Bartolomé de las Casas was an historian and social reformer before becoming a Dominican friar. He was the first resident Bishop of Chiapas and the first official Protector of the Indians. Bartolomé de las Casas was born in Seville on 11 November 1484. His father, Pedro de las Casas, a merchant, was descended from a family that had migrated from France to Seville. One biographer says, his family were of converso heritage, descended from Jews who had been forced to convert to Christianity to escape the Inquisition. Las Casas and his father migrated in 1502 with the expedition of Nicolás de Ovando to the island of Hispaniola – divided today between the Dominican Republic and Haiti. There, Las Casas became a hacendado and slave owner, taking part in slave raids and military expeditions against the Taíno people of Hispaniola. When he was ordained a priest 1510, he was first priest ordained in the Americas. A group of Dominican friars led by Pedro de Córdoba arrived in Santo Domingo in September 1510. Appalled by the injustices they saw, they decided to deny slave owners the right to confession. Fray Antonio de Montesinos, a Dominican friar, preached a sermon in December 1511, implicating the colonists in the genocide of native people. The colonists, led by Diego Columbus, sent a complaint against the Dominicans to the King of Spain, and the Dominicans were recalled from Hispaniola. But while Las Casas was studying a passage in Ecclesiasticus (Sirach) 34: 18-22 as he prepared a Pentecost sermon in 1514, he became convinced that Spanish activities in the New World were illegal and a great injustice. He gave up his slaves and began preaching that other colonists should do the same. He soon realised he would have to take his campaign to Spain and arrived back in Seville in November 1515. While King Ferdinand lay ill in Plasencia, Las Casas was provided with an introduction to the king by Diego de Deza, Archbishop of Seville, and they met on Christmas Eve 1515. However, King Ferdinand died on 25 January 1516. At first, Las Casas argued that Black slaves should be brought from Africa to relieve the suffering Indians. But he later rejected this idea too, and also became an advocate for Africans in the colonies. He also proposed fortifying the northern coast of Venezuela, establishing ten royal forts to protect the Indians and starting up a system of trade in gold and pearls. When he arrived in Puerto Rico in January 1521, he heard the Spaniards of the islands had launched a raid into the very heart of the territory that he wanted to colonise peacefully. He entered the Dominican monastery of Santa Cruz in Santo Domingo as a novice in 1522 and took vows as a Dominican friar in 1523. He worked throughout Hispaniola, Peru, Panama, Nicaragua, Guatemala and Mexico, and came into conflict with the Franciscan orders and their approaches to the mass conversion of the Indians. As a direct result of the debates between the Dominicans and Franciscans and spurred on by Las Casas’s treatise, Pope Paul III promulgated the Bull Sublimis Deus, which stated the Indians were rational beings who should be brought peacefully to the faith. Las Casas returned to Guatemala in 1537 with two mission principles: to preach the Gospel to all and treat them as equals, and conversion must be voluntary and based on knowledge and understanding of the Faith. Las Casas then spent a year in Mexico, before returning to Spain in 1540, where he secured official support for his Guatemalan mission and continued his struggle against the colonists’ mistreatment of the Indians. He presented a narrative of atrocities against the natives of the Indies and argued for new laws and legal protections. Before Las Casas returned to Spain, he was also appointed as Bishop of Chiapas. He was consecrated in the Dominican Church of San Pablo on 30 March 1544, and took possession of his new diocese when he returned in 1545. 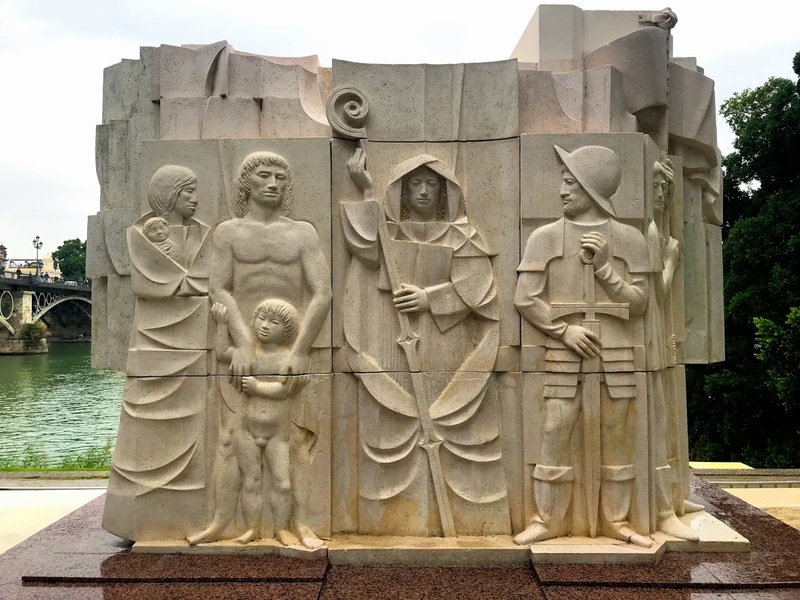 As a bishop, Las Casas was embroiled in frequent conflicts and in a pastoral letter on 20 March 1545, he Casas refused absolution to slave owners, even on their death bed, unless all their slaves had been set free and their property returned to them. He also threatened to excommunicate anyone who mistreated Indians within his diocese. He became so unpopular among the Spanish colonists that he had to leave his diocese, never to return. He left for Europe in December 1546, arriving in Lisbon in April 1547 and in Spain in November 1547. In 1548, the Crown decreed that all copies of his Confesionario be burnt. But he publicly defended his views on slavery, mission, war and the rights of Indians in a formal, public debate in Valladolid in 1550-1551. Juan Ginés de Sepúlveda argued that the Indians were less than human and required Spanish masters in order to become civilized. But Las Casas maintained that they were fully human and that forcefully subjugating them was unjustifiable. Las Casas spent the rest of his life working closely with the imperial court in matters relating to the Indies, working on behalf of the natives of the Indies, with many of them asking him to speak directly to the Emperor on their behalf. He had to defend himself repeatedly against accusations of treason, and was denounced to the Spanish Inquisition. His extensive writings, including A Short Account of the Destruction of the Indies and Historia de Las Indias, chronicle the first decades of the colonisation of the West Indies and describe the atrocities committed by the colonisers against the indigenous peoples. He died in Madrid on 18 July 1566. Although he failed to save the indigenous peoples of the Western Indies, his efforts improved the legal status of the natives, and increased focus on the ethics of colonialism. Las Casas is often considered to be one of the first advocates of the universal human rights. 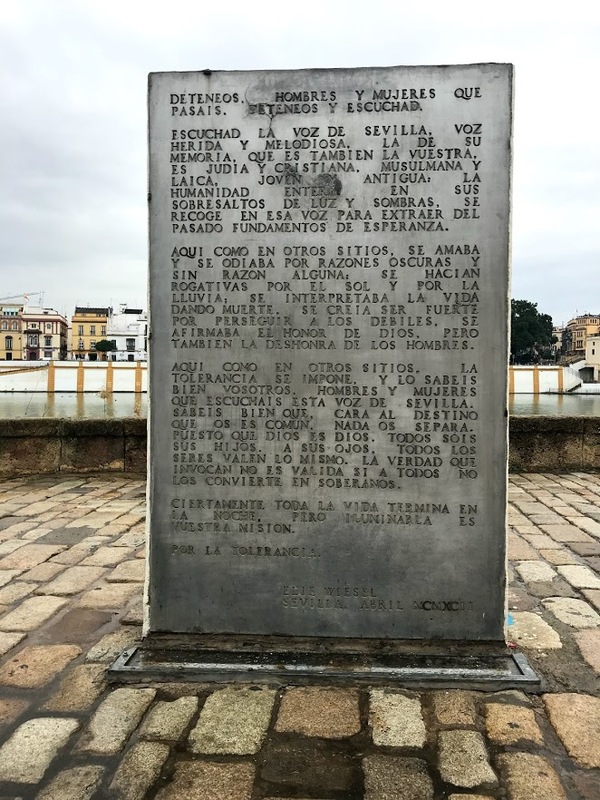 Sadly, the monument is fenced off to deter repeated graffiti and attacks by vandals who do not value the monumental and cultural legacy of Seville. 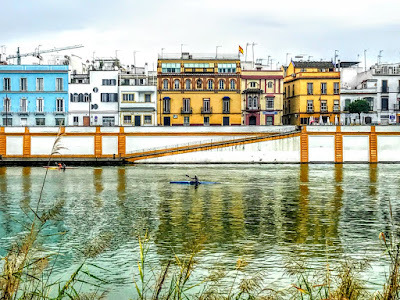 On Friday afternoon, I took a stroll along the banks of the River Guadalquivir in Seville, from the Torre del Oro and the Puerta de Jerez to the Puente de Isabel II, the bridge that crosses the Guadalquivir river and links the heart of Seville with the barrio of Triana on the other side of the river. 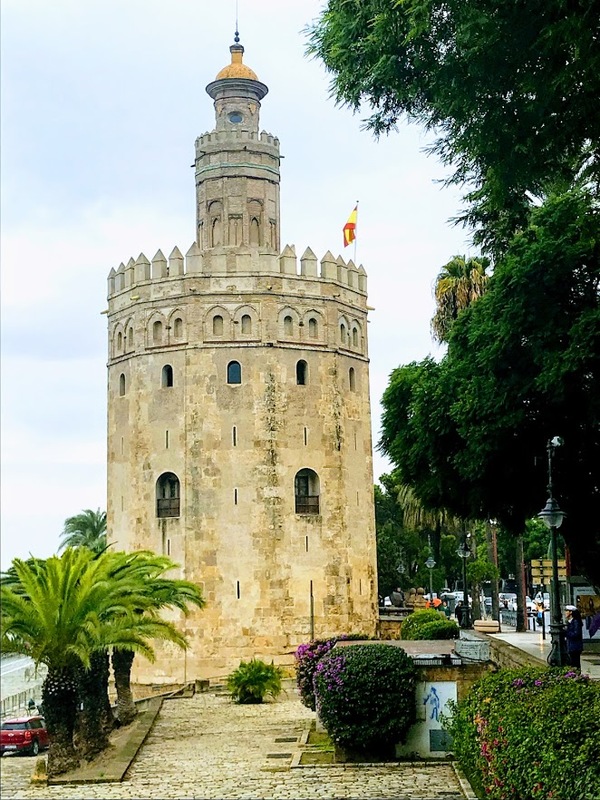 Many of the boat trips along the river begin beneath the Torre del Oro, a crenelated tower built by the Moors in the 13th century to protect the port and now housing a small maritime museum. The long, tree-lined promenade between the Paseo de Cristóbal Colón and the east bank of the river is also an ideal place to relax, watching scullers and rowers practice their strokes earnestly. 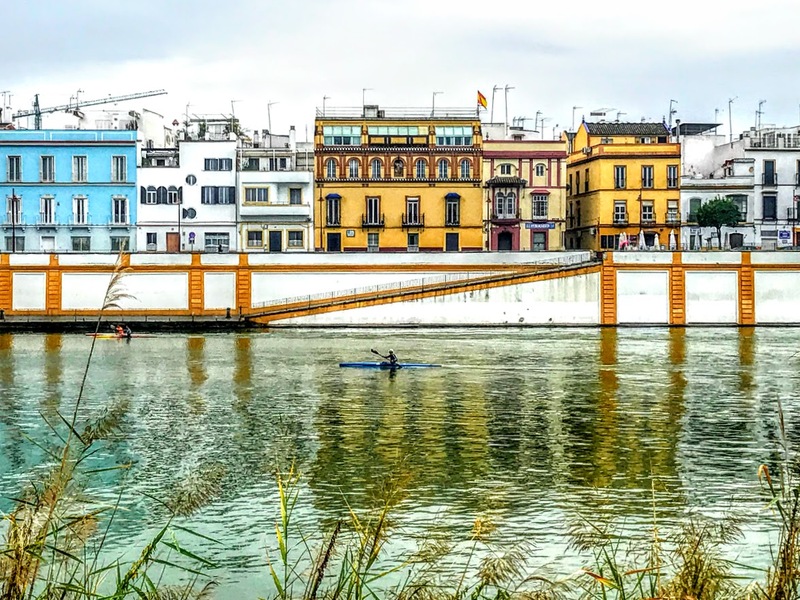 Two sculptures on this side of the river, close to the Triana Bridge, are moving reminders of tolerance and intolerance in Seville and of a friar from Seville who is regarded as a father-figure in the development of international human rights. 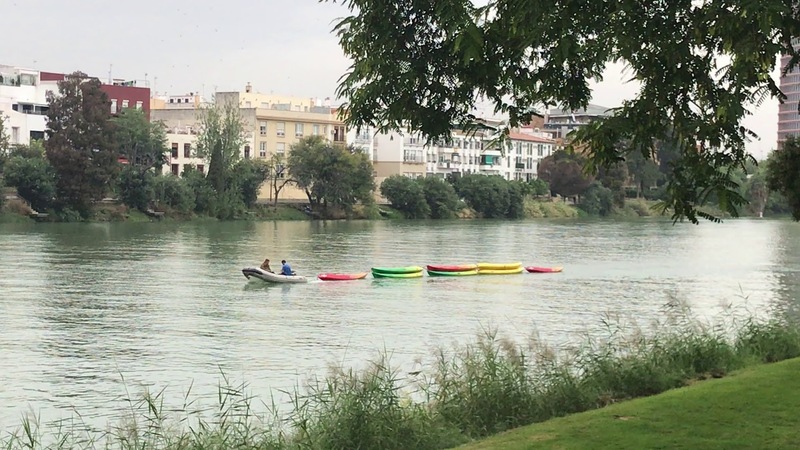 The Guadalquivir River was used by the Phoenicians, the Romans, who built Hispalis on the site of present-day Seville in the 2nd century BC, and the Moors during their rule between 712 and 1248. And, of course, the ‘Catholic monarchs,’ Isabella and Ferdinand, brought all that gold and silver from the New World up this same river. But Ferdinand and Isabel also signed the Decree of Alhambra expelling the Jews from Spain in 1492. It seems appropriate, then, that Eduardo Chillida’s ‘Monument to Tolerance’ and the sculpture by Emilio García Ortiz of Fray Bartolome de las Casas, a Dominican friar and bishop and early human rights activist who campaigned against mistreatment of slaves, should stand on the east side of the Puente de Isabel II or Puente de Triana. 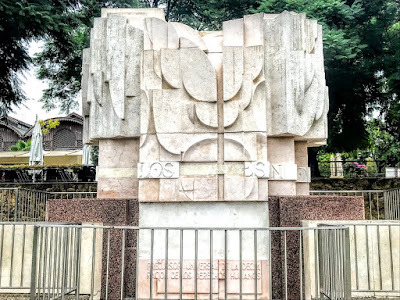 The ‘Monument to Tolerance’ was installed as a piece of public art in 1992 as part of the Seville Expo ’92 and was inaugurated by President Chaim Herzog of Israel to mark the 500th anniversary of the expulsion of the Jews from Spain in 1492. 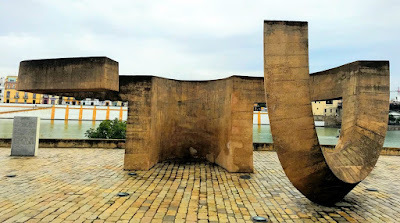 The sculptor Eduardo Chillida (1924-2002), a celebrated Basque artist, is known for his large-scale sculptures in museums, parks and public squares across the world. He was born in San Sebastián and spent much time in both Madrid and Paris. Many of his works are dedicated to public figures or commemorative events, and tolerance is a theme running through many of his work. This sculpture on the banks of the Guadalquivir celebrates the tolerance once shared in Seville by the three great monotheistic faiths, Jews, Christians and Muslims, but that was destroyed by the Inquisition in 1492. Is it a stylised menorah, broken by the antisemitism of the Inquisition, when the light of Judaism was quenched in Spain? Or is this someone generously offering an understanding embrace or a lonely figure seeking the solace and comfort of a hug? támbien la deshonra de los hombres. que escuchais esta voz de Sevilla. que os es común, nada os separará. la noche. Pero iluminarla es nuestra misión. Stop all who pass by, men and women. Stop and listen. 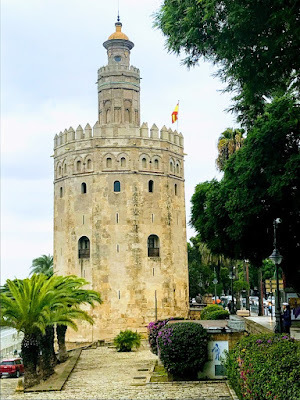 Listen to the voice of Seville, a voice that is wounded and melodious. This memorial, which is also yours, is Jewish and Christian, Muslim and secular, young and old. Humanity is created in both light and darkness, it develops in that voice that reaches down to the foundations of hope, deep in the past. Here as in other places, they loved and they hated themselves for dark reasons and for no reason at all. They prayed in the sun and the rain. Life was understood in death, and believed it had found strength in persecuting the weak. It affirmed the honour of God, yet at one and the same time brought dishonour to humanity. Here as elsewhere, tolerance prevails, and you know it well, men and mothers, who heed this voice of Seville. You know well that, faced with your shared fate, nothing separates us from each other. Since God is God, you are all his children. In his eyes, all of us are of equal value. The truth they invoke has no valid unless it makes sovereign beings of all. Certainly, all life ends in the night, but to bring light to it is our mission. Appropriately, across the river in Triana, the ruined Castillo de San Jorge was once a seat of the tribunal of the Inquisition in Seville. The ‘Monument to Tolerance’ invites reflections on this dark period in European history.